For the second time in the first half Sunday, coach Michael Moynihan trotted out on the field to make his case. The referee had called a penalty on freshman defender Hayley Lawson in the goal box. Lawson didn’t see it that way. Freshman goalkeeper Mackenzie Wood also disagreed and Moynihan waited for Wood to be given the ball. Minnesota forward April Bockin earned the opportunity after beating Lawson down the field and, apparently, drawing contact as she tried to cut in front of her. After Moynihan spent some time arguing for a no-call, Bockin drilled her penalty kick past Wood and into the bottom left corner. According to Moynihan, Northwestern never really recovered after the 25th-minute goal, and the No. 21 Wildcats (6-1-2, 0-1-1 Big Ten) lost 2-0 on Sunday at Minnesota (5-4-0, 1-1). It might not have been as crippling a sequence had NU converted 18 minutes earlier, when the Cats had their own penalty kick after deliberation between the officials went in their favor. Junior midfielder Marisa Viggiano fired an attempt from outside the box, and her shot hit the arm of a Gopher defender not far from the goal. At first, the refs signaled for a penalty kick. Then, the referees surprised Moynihan by awarding Minnesota a goal kick. Moynihan made his case, and this time he won it, but Viggiano kicked her penalty kick right into the diving body of goalkeeper sophomore Maddie Nielsen. Moynihan said the first decision influenced the second. “I just have a feeling the call he made against us might have been a way to even things out,” Moynihan said. After falling behind 25 minutes into the game, NU was only able to create one more substantive chance on goal. In the 61st minute, a loose ball in the Minnesota box found senior defender Kayla Sharples, but she volleyed the potential equalizer over the crossbar. “I thought against Wisconsin (on Friday), we created a number of really good chances to score but today we didn’t,” Moynihan said. While NU was able to create a number of chances against Wisconsin and forced 7 shots on goal, the Cats tied the Badgers 1-1 on Friday and were held to just one shot and zero corner kicks in the two overtime periods. NU scored in the 34th minute Friday when senior midfielder Michele Chernesky headed in a ball off a set piece. Even from the goalkeeper position, Wood came to a similar conclusion as her coach about their play Sunday. After Minnesota controlled possession for much of the second half, Gophers midfielder Megan Gray lofted a cross from the left side over the Cats’ defense, and midfielder TJ McKendrick headed it into an empty net in the 71st minute. 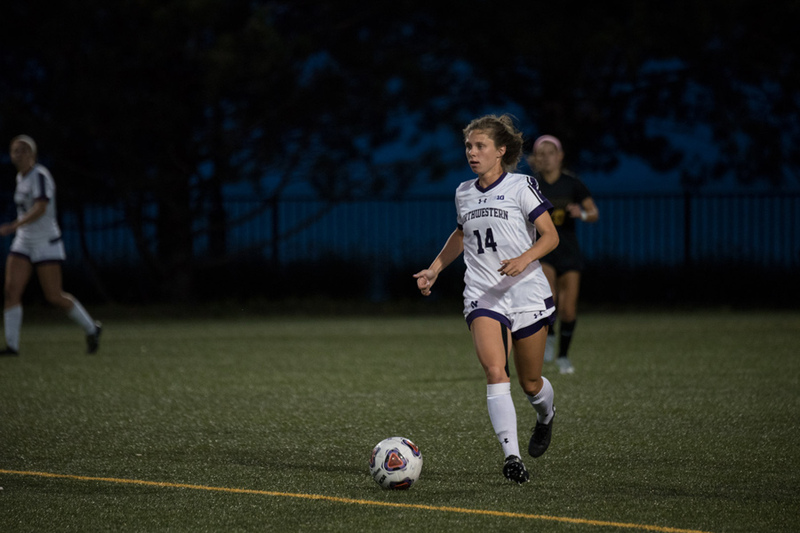 For the past few games, NU has been without two of its most dynamic goal scorers, sophomores Madi Kennel and Nia Harris. Still not at full strength, NU hosts No. 20 Penn State on Thursday on Big Ten Network in a rematch of last year’s Big Ten Championship game.